The "modified type" is the fully-sugared type to which the attributed type was applied; generally it is not canonically equivalent to the attributed type. The "equivalent type" is the minimally-desugared type which the type is canonically equivalent to. Definition at line 4437 of file Type.h. Definition at line 4439 of file Type.h. Definition at line 4529 of file Type.h. Definition at line 4466 of file Type.h. Definition at line 4458 of file Type.h. Referenced by clang::getParameterABISpelling(), handleMSPointerTypeQualifierAttr(), clang::ASTNodeImporter::VisitAttributedType(), and clang::ASTTypeWriter::VisitTagType(). Definition at line 4463 of file Type.h. 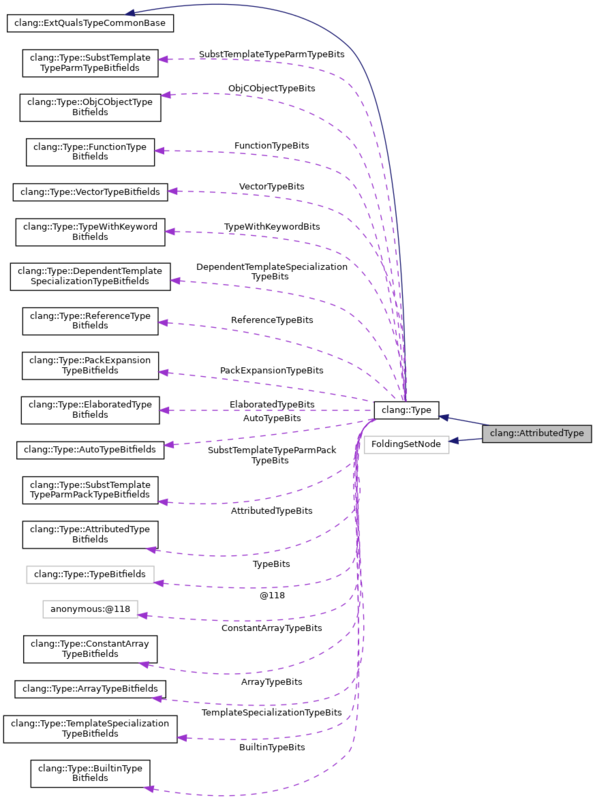 Referenced by clang::getParameterABISpelling(), handleMSPointerTypeQualifierAttr(), clang::TreeTransform< Derived >::TransformDependentTemplateSpecializationType(), clang::ASTNodeImporter::VisitAttributedType(), and clang::ASTTypeWriter::VisitTagType(). Definition at line 3902 of file Type.cpp. References clang::None, clang::NonNull, clang::Nullable, and clang::Unspecified. Referenced by clang::getParameterABISpelling(), and clang::TreeTransform< Derived >::TransformDependentTemplateSpecializationType(). Definition at line 4462 of file Type.h. Referenced by clang::Sema::getCallingConvAttributedType(), clang::getParameterABISpelling(), clang::Type::hasAttr(), clang::TreeTransform< Derived >::TransformDependentTemplateSpecializationType(), clang::ASTNodeTraverser< Derived, NodeDelegateType >::VisitAttributedType(), clang::ASTNodeImporter::VisitAttributedType(), and clang::ASTTypeWriter::VisitTagType(). Retrieve the attribute kind corresponding to the given nullability kind. Definition at line 4493 of file Type.h. Referenced by computeConditionalNullability(), and clang::ASTContext::getArrayDecayedType(). Definition at line 3310 of file Type.cpp. Referenced by clang::Sema::getCallingConvAttributedType(), and clang::getParameterABISpelling(). Definition at line 3297 of file Type.cpp. Does this attribute behave like a type qualifier? A type qualifier adjusts a type to provide specialized rules for a specific object, like the standard const and volatile qualifiers. This includes attributes controlling things like nullability, address spaces, and ARC ownership. The value of the object is still largely described by the modified type. In contrast, many type attributes "rewrite" their modified type to produce a fundamentally different type, not necessarily related in any formalizable way to the original type. For example, calling convention and vector attributes are not simple type qualifiers. Type qualifiers are often, but not always, reflected in the canonical type. Definition at line 3274 of file Type.cpp. Definition at line 4465 of file Type.h. Definition at line 4518 of file Type.h. Definition at line 4522 of file Type.h. Strip off the top-level nullability annotation on the given type, if it's there. T The type to strip. 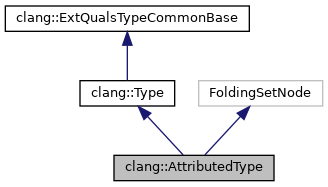 If the type is exactly an AttributedType specifying nullability (without looking through type sugar), the nullability is returned and this type changed to the underlying modified type. the top-level nullability, if present. Definition at line 3912 of file Type.cpp. Referenced by clang::Type::castAsArrayTypeUnsafe(), checkNullabilityTypeSpecifier(), formatObjCParamQualifiers(), clang::Sema::getMessageSendResultType(), clang::DecayedType::getPointeeType(), and clang::Sema::ProcessPropertyDecl(). Definition at line 4442 of file Type.h.